Anything can happen on the road in during the winter months. At Dover Dodge's Pre-Owned Supercenter, our goal is to help you with preparations. 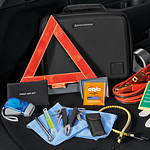 Whether you're broken down or trapped in a snowstorm for hours, a winter survival kit can keep you safe. There are quite a few things to include. First, consider your comfort. If you're trapped for hours while waiting for help to come, you're going to get cold. Have blankets, gloves, and hats inside the vehicle. You might want to consider sleeping bags, too. It's also a good idea to stock water bottles and protein bars. Next, focus on ways to get out of a certain situation. Stock snow tires into your survival kit along with an ice scraper for your windshield. Road flares should be used to alert help where you are. A stocked first aid kit should be present, too, in case there are injuries.